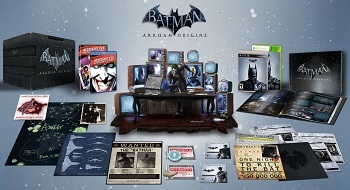 Fans of the Bat can pick up the Batman: Arkham Origins Collector's Edition for $119.99 when the game launches. October should be a good month for fans of the Batman. In addition to Halloween, ever the perfect excuse to don your finest Bat-ware, the end of the month will also be playing host to the release of Batman: Arkham Origins, the latest game in the ongoing Arkham series. Now, Warner Bros. Interactive Entertainment has unveiled a new special edition version of the game that's likely to spark the interest of many a fan of the Dark Knight. Exclusive statue of the Joker. Reproductions of evidence from the Gotham crime lab. Intel dossier including Black Mask's contract and info on the eight assassin's hunting Batman. 1st Appearance Skin: A special skin that will transform Batman's costume into the same one he wore in Detective Comics #27. Deathstroke Challenge Pack: Challenge maps where you'll get to play as Deathstroke. Overall, it's a pretty decent assortment of Bat-swag, something reflected by its price. Gamers hoping to pick up the Collector's Edition will have to fork over $119.99, roughly double what the game costs by itself. The Collector's Edition will become available for PS3 and Xbox 360 on October 25th.